TRIESTE, Italy – At Sigep, the Italian and world Roasting finals of the SCA circuit have just concluded, during which the competitors utilised the single origins supplied by the Trieste coffee importer, Imperator, and their Colombia Bolivar Estate Natural coffee for the international competition and Colombia Bolivar Estate – Washed Farallones, Colombia Bolivar Summer Natural, Peru Felix Phoro Washed and Brazil Ouro Verde Natural – for the national competition. 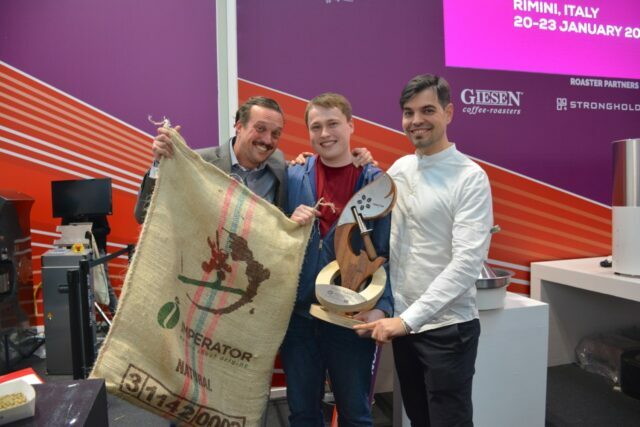 Among the specialty coffees, natural Colombia was a popular choice for both competitions. “I chose to bring this origin to the World championships because of its intense aroma and completeness” said Alberto Polojac, owner of the company, “it lends itself to multiple interpretations not only in the roasting curve but also when creating a blend”. This was confirmed by the young World Roasting Champion for 2019, the Russian Vladimir Nenashev, 24 years of age from Samara, who achieved the victorious blend, with 80% of this coffee, beating the 22 finalists from all over the world with a score of 486.25. Vladimir started roasting as a hobby and it now has become his work for the last four years at Mosaic Coffee Roasting Company in his home country. “I couldn’t quite complete the roasting of the Colombian sample but, despite this, I realized its enormous potential when I tasted it so I decided to focus on it. It was the only one that could offer me stability and I used 80% of it to prepare my blend which ultimately led me to victory!”. Following the Russian champion onto the podium for the World Championships was second-placed Yoshiyuki Nakamura (483.50) from Japan and third-placed Veda Viraswami (482.00) from France. Among the six competitors of the Italian finals was the ultimate winner Michele Anedotti, who since 2013 has roasted coffee at Ditta Artigianale. “The beauty of this process lies in identifying and highlighting the soul of green coffee, that is, its aromatic component” said Michele. And this he certainly did with the four specialties from Imperator! With the single origin, Colombia Bolivar Estate – Farallones washed, he set the roasting curve in order to contain its acidity thus achieving a good balance in the cup. For the blend he decided to exploit the potential of Colombia Bolivar Estate Natural of which he used 80% together with 10% each of Peru Felix Phoro and Brazil Ouro Verde Natural producing a cup that was both pleasant and balanced. “The quality of the raw material is fundamental for roasting companies who want to offer something new and consider roasting more and more as an artform to study and refine,” says Alberto Polojac, who recently inaugurated the new Roasting room in his Bloom Coffee School, a training school that boasts the recognition of SCA as Premier Training Campus. The course calendar is on the website: https://www.bloom.coffee/en/timetable. The next important appointment is the Roasting Masterclass in collaboration with Morten Münchow – roasting specialist and creator of Sca’s Certification System for Coffee Roasting from 13 to 15 February – certainly the most important event hosted by the Bloom Coffee School to date. Science, coffee chemistry, roasting, quality control, sensory analysis, are all aspects that will be explored during the three days of high-quality instruction thus acquiring a scientific methodology to the world of coffee roasting. Originates from the Antioquia department in Colombia and is cultivated at an altitude of 1850 meters. After harvesting, it is left to ferment for 24 hours and to dry in the sun for 20 days. In the cup it has a medium body and acidity. The aroma is of red grapes, tamarind, blueberry, dark chocolate and brown sugar; the taste is of red grapes, blueberries, brown sugar; the persistent aftertaste is of brown sugar.